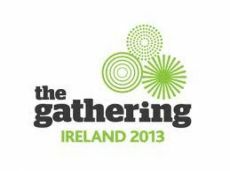 The Gathering Ireland 2013, referred to as The Gathering is a Tourism-led initiative in Ireland.It aims to mobilise the Irish Diaspora to return to Ireland during 2013 to be part of specially organised local gatherings and events during the year. It is a goverment supported initiative driven primarily by Failte Ireland, the National Tourism Development Authority, and Tourism Ireland. The concept relies on grassroots initiatives of private individuals, and non-governmental organisations. The Gathering is not a single event but provides an umbrella framework for varied activities throughout 2013, from family reunions and clan gatherings to sports fixtures. While the initiative is primarily directed at the Irish diaspora, and those with other links to the country, the organisers hope the experience for the general tourist will also be enhanced. The 40th International Bachelor Reunion Festival Celebrations is expected to reunite a number of overseas winners of prebious ballybunion bachelors over the past 40 years ! Bachelors aged 26 to 46 come from all over the world to Ballybunion for a week of fun and entertainment! Many gentlemen meet their true love in Ballybunion and many happy lives have been formed as a result of this festival over the past 40 years. Events include a street carnival, family fun festival, fireworks, French markets, pub music, a festival club and the highlight of the celebrations is the selection of the 40th International Ballybunion Bachelor. There will also be a children's fancy dress, treasure hunt, terrier racing, foam party, bouncy castles and lots more over the course of the week. Thomas McCarthy Piping Festival is predominantly a Traditional Irish Music Festival which incorporates music, song and dance all in one location – Ballybunion! It showcases its various forms on Irish heritage and engages both national and international guests to learn new forms through workshops and master classes. There will be performances from great Irish Pipers and a dance show showcasing Thomas McCarthy’s life. Our Festival will feature Ballybunion walks where Thomas performed. We invite people to come back to their roots and enjoy our culture and heritage. The Kilcooley O’Connor Clan Gathering will see Kilcooly O’Connor’s from all over the world descending on the town of Ballybunion for a weekend of music, celebration and history, a chance to meet relatives and re ignite friendships. During the weekend, guests will stay in Kilcooly’s Country House, where there will be a marquee to accommodate for evening meals and entertainment. So far there are guests who will be attending from New Zealand, Argentina and the UK. Anyone who is interested in attending this historic and fun filled clan gathering should contact John for more information. The Gathering Ireland at Ballybunion is a wonderful time reuniting all the family from all over the world.